Professional looking website is an important part of restaurant’s marketing. Our restaurants WordPress theme brings new possibilities how to reach your customers. Special element to present your a la carte menu. Use Open Table applications to receive bookings from your visitors. - Update: Added response notification for wp_mail ajax in contact form element. Now there is also a notification if the mail wont send. - Improvement: Export only images which are in media library and all their sizes. This results in reduced size of exported content. - Fix: Do not display comments element on irrelevant pages in Page Builder, such as 404, search page, etc. - Fix: Special edge case whean footer area has title "Footer 1"
- Fix: When Visual Editor is disabled in user settings, Text Element in Page Builder doesn't work. - New: AIT Languages plugin is no more pre-packed with theme. And also all translations from theme are moved to AIT Languages plugin. Theme package has smaller size in MB. Just update the AIT Languages plugin and the theme and everthing will work as previous. - Update: Minimum requirements for our themes and plugins are PHP 5.3.1 and WordPress 4.0. It's time to use modern and secure technologies. - Fix: Fixed login screen tooltip on logo - it displays correctly text from "Theme Options -> Admin Branding -> Login Screen Logo Tooltip"
- Fixed: Some problems with AIT Languages plugin and non-english WordPress installs. Please update AIT Languages plugin. - Fixed: Compatibility between WooCommerce and our AIT Languages plugin, product search is working now. Please update AIT Languages plugin. Gourmet is a great solution for restaurants, caffés as it's fully customized to handle this kind of business. It includes everything (and even more) what this business sector needs. There are 4 predefined homepages to show you that you are able to build anything you need, just by using our page-builder elements. It's as easy as drag & drop. You need this theme as much as your customers need a decent website and count with professional attitude and transparent information. The main feature which Gourmet provides is ability to show your food-menu with “Products” element. You can build regular, daily, or categorized menu with ease. You just set the title, price and any description you need. Product can be featured likewise, as you can see the last product in the above screenshot. In the demo website there are also predefined ways and options to inspire you creating yours. Open Table Widget is a powerful WordPress widget that allows you to create powerful restaurant reservation forms for your website. 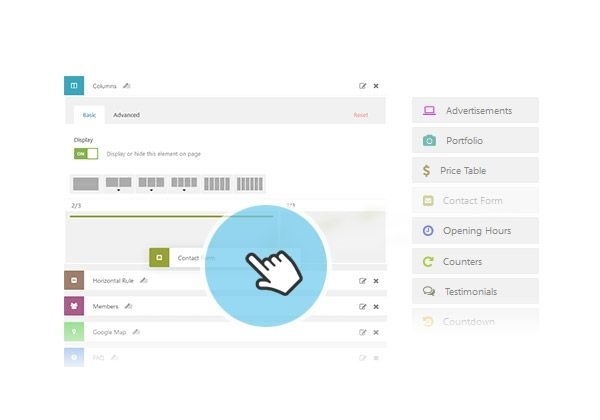 Easily configure reservation forms that will look and function amazingly. Help increase the number of reservations and revenue by utilizing the power of Open Table ultimately. Widget is fully designed to be placed fullwidth or in sidebars and columns. That is not a feature provided by widget itself out of the box. You can easily do so with our “Widget Area” element so you are not limited to sidebars anymore. You can create unlimited widget areas and use them anywhere on your website. Widget areas dan be included into the content. It’s excellent for 3rd party plugins integration. How does Open Table widget work? 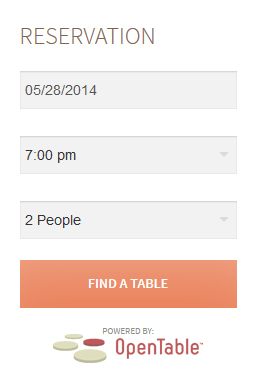 Customer then just pick a date, time, size of the table and form will redirect him to opentable.com where everything is handled. If you have multiple restaurants, you can upgrade to the pro version which offers the option for customers to pick the specific restaurant too. Each theme includes specially developed features and elements for it's specific segment. Apart from that you will get all amazing standard and business features you can use anywhere on your website. Have a look below for more details. Hi guys does the GOURMET theme supports woocommerce? I’m interested in Gourmet theme but I don’t know if you can select different languages as for example catalan. I don’t want an automatic translation. Catalan is not available for the moment. We do not provide translation automatically like google translation. It’s done manually be 3rd party company which is in cooperation with Ait-Themes. You can make also your own translation if the language is not available. Please read more at: https://www.ait-themes.club/knowledge-base/how-do-i-add-new-language-which-is-not-included-in-theme/ . Thank you and have a nice day. Firstly great looking theme with many features. I’m interested in purchasing this, however how easy is woo-commerce to integrate? My client owns a bespoke cupcake company (classy) her branding colours are magenta/pink and black. Can I style the theme with these colours? Via a colour picker precise colour match? Hi, is it possible when buying to download a demo website to import in wordpress. thanks! Please note that images used on our demo site are not included as these are all proprietary images and we cannot resell them. Very cool theme. But, can i change the theme colors to something other than brown. i’m assuming i can? I want to build a radio/video website. When people serving on the website the radio should always be playing and be accessible. Members should upload their playlists and do live calls, chat etc. Q: Which one of your themes is excellent for this project? I want to build an e-learning website. Is it possible to make the fonts bigger on your themes? 1. We have no such a theme where members/users could have an access to video post types, moreover our themes are not tested with a 3rd party plugin for chats, live calls etc. Verím, že som pomohol. V prípade ďalších otázok, neváhajte nás kontaktovať späť. I would like to know whether I can use one theme on multiple sites or I need to pay for additional license for the purpose. we have multiple license, you can use on as many sites as you need. Hi, I activated my subscription 4 days ago and Im trying to download the gourmet theme but I just get the demo, cant you tell me whats going on? Should your issue still persists, Ait-Themes team is ready to help you with any theme-regarding issue: Customer Support is provided during working days from 8am to 5pm Central European Time. I wanted the capabilities of the Events Pro plugin (i.e. specific times for entertainment, special dinners, etc.) but when I install it says it’s not compatible with my theme. The Events function that comes with the theme is too limited. Any chance Events Pro will work with Gourmet soon? thanks for interesting in Events PRO plugin. We are sorry, we have no plan to extend the compatibility of the plugin with Gourmet theme within coming weeks, months. Free version of the theme doesn’t use AIT Toolkit plugin: https://www.ait-themes.club/wordpress-plugins/ait-elements-toolkit/ (which means: no pre-made custom post types, no Elements to show them in Page Builder, search form without some functionality, no sidebars etc). All you can do with free theme version is setting of colors and some basic functionality, in fact theme is suitable for personal use only (not ready for commercial purpose, no technical support). Translate: One of my sites is a news site. Though i would like to have the site pages, menus etc available in different languages, it is not practical to translate the actual blog news. Would it be possible to use something like a google auto translate plug in for the post content only? thanks for interesting in our products. Gourmet theme is compatible with AIT Languages plugin that provides theme language localization of the back-end and front-end. The content should be translated manually by admin or user. We are sorry, we have no other options, thanks for understanding. Restaurant Themes. We are in Spain and unfortunately open table is not available here. Do any of the themes have and non-open table booking functions? we’d like to inform you that there is an issue with the new version of plugin easyReservations and our themes which support this a 3rd party developer’s plugin. We are working hard to fix incompatibility with new version asap in all supported themes (within coming days). Meantime, we recommend to do not update easyReservations plugin to latest version 4 where were made many changes in the core of plugin. Changes cause incompatibility problem with our themes and necessary is redesign and fix compatibility in all themes which support easyReservations plugin. If you have already updated plugin to version 4, we recommend you to contact plugin developer to get previous version of plugin which works with our themes well. Which version of PHP is the gourmet theme compatible with?